Find out what else VOGUE.co.uk has to say about the Designer Jumble Sale popping up in Camden. Their words, not ours. But we do love it. Thanks to the fabulous team at TwentySomethingLondon for supporting our next popup, opening at 69 Camden High Street on 25 June FOR ONE WEEK ONLY. 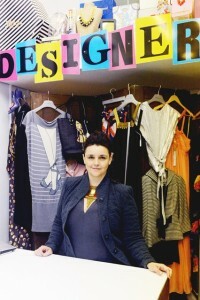 Interviewed by Vogue for the upcoming Designer Jumble Sale for Charity. Read more over at Vogue.co.uk. Our twice-yearly Fashion Week Designer Jumble Sale for Charity added to the official London Fashion Week calendar! Read more over at London Fashion Week. Coverage of our first shop opening by Vogue. Glam.com praised our “environment perfect for festive shoppers looking for a bargain” in their coverage of our opening night. Read more over at Glam.com. The Evening Standard have highlighted us as one of their favourite Christmas shopping destinations for the smart Londoner. Read more over at Evening Standard. The pop-up story begins! DJS wins the Farebrother competition to pop-up in Lamb’s Conduit Street against a field of 90 other applicants. Read the full article over at Farebrother. 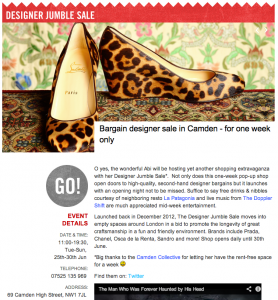 Keep up to date with the Designer Jumble Pop-up Shop and our Charity Sales. © 2019 The Designer Jumble Sale.